We have 5 weeks to go before the book launch of our guide. We want you to know exactly what to expect from the book and to get to know the amazing people behind this project! Every week you will be able to check in on our website in order to find a new essay, article, artist or business from the guide. J Henry Fair, who is known for his aerial photographs of environmental destruction and pollution. His works were part of many prestigious exhibitions and have been featured in The New York Times, the National Geographic, Vanity Fair, TIME and others. Furthermore, Henry has participated in a number of activist roles and efforts which include his role as co-founder of the Wolf Conservation Center, regularly giving symposia and collaboration with various environmental organizations. 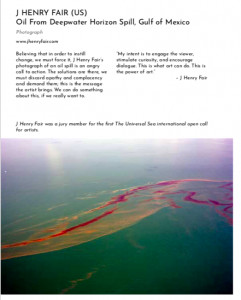 J Henry Fair is based in New York and Berlin and was a jury member for The Universal Sea first open call. Henry’s photographs are at first glance beautiful and abstract. Their bright and vivid colors immediately draw in the viewer, yet a closer look reveals a much darker meaning. 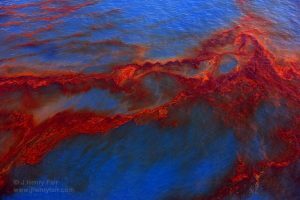 In juxtaposition to their aesthetic appeal, the photographs depict the ugly reality of oil spills, occurred industrial areas, coal mining and toxic waste deposits. All of the photographs were taken by the artist out of the open window of a plane and depict the scenes from a bird’s eye view. His message is very clear. He wants to raise awareness about the devastating impact that our consumer society has on the natural environment. J Henry Fair believes that in order to grab the attention of the viewer, the images must be beautiful. What makes his work so powerful is the contrast between the initial allure and and subsequent shock that each photograph triggers. This emotive response reinforces the urgency of our need to solve these issues on a deeply personal level. J Henry Fair’s ‘Industrial Scars’ series is being displayed in an exhibit titled ARTEFAKTE at the Museum für Naturkunde in Berlin. The show runs through September 2019. 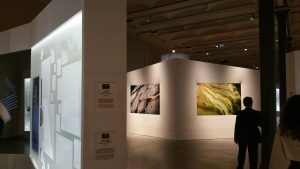 Aside from the artist’s 20 large-format photographs, the exhibition presents scientific statistics and information (provided by scientists from the Joint Research Centre of the European Commission), about environmental damage. Alongside these are examples of how politics and science collaborate to find solutions as well as recommendations for how to reduce one’s personal environmental footprint. 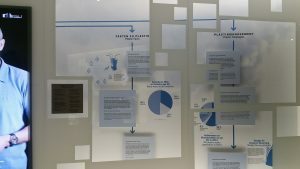 With its combination of J Henry Fair’s breathtaking photographs with videos and factual information, “ARTEFAKTE” engages visitors in a dialogue about how we as individuals and communities can take action. 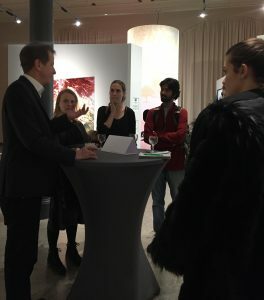 J Henry Fair explaining his work at an interactive discussion round at the Natural History Museum in Berlin, 2019. Find out more about J Henry Fair on his website.